In brief: Back at August’s IFA event, 8K was the new buzzword. 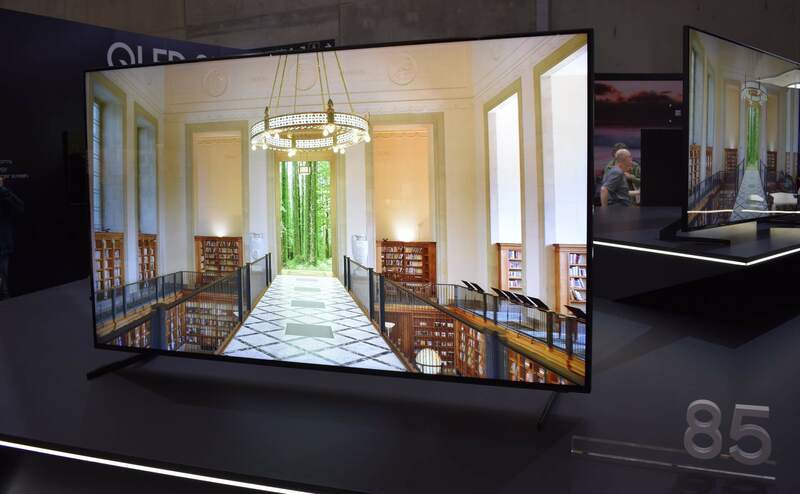 LG, Sony, and Sharp all had TVs on show that featured the incredibly high resolution, but it was Samsung’s Q900R series that really caught the eye. Now, the company has opened US pre-orders for the 85-inch behemoth ahead of the October 28 shipping date. If you want one, be prepared to hand over $15,000. Samsung also had 65-inch, 75-inch, and 82-inch (below) versions of its Q900R televisions at IFA. But the largest 85-inch model, one of our top picks from the event, was particularly stunning. The company wasn’t prepared to reveal launch dates or prices at the time, though the flagship was expected to come with a five-figure price tag. In addition to offering 16 times the pixels of an HD TV, the QLED television boasts the latest HDR10+ format and a massive peak brightness of 4000 nits, giving it incredible colors and sharpness. Samsung is obviously pushing the Q900R’s 8K capabilities as its biggest draw, but there’s virtually no 8K content right now. The company says it gets around this issue with the TV’s Quantum Processor 8K, which can upscale content to an 8K resolution without the usual jagged edges and noise associated with the technique. The Q900R also comes with Ambient Mode, which, when the TV isn’t being used, shows information such as news headlines, your photos, and patterns that match the background wall. You also get Bixby, voice commands, personal recommendations, improved sound, automatic mode detection (including for gaming), and more. $15,000 is no small amount of money, of course. The 85-inch Q900R’s price is colossal, especially when you consider Samsung’s excellent 4K 75-inch Q9FN QLED costs around $6000 and has many of the same features. For those who simply must have the latest tech, Samsung is offering a payment plan of $416.70 a month for 36 months. There’s still no word if or when Samsung will bring the other Q900R models to the US. They’re available to pre-order in the UK, with the 65-inch version going for £4999 (around $6474) and £6999 for the 75-inch (around $9064), making them a ‘cheaper’ option for early 8K adopters.